On day one, arrive into Incheon airport, transferring to Seoul. Next morning, leave for Gongju. Visit Gongsanseong Fortress, the Tomb of Muryeong King, and Magoksa Temple. Experience a tea ceremony with a Buddhist monk. Head on for Daejeon for an overnight stay. Next day depart for Jeonju, home of Korean Culture and tradition. Visit Jeonju Hanok (Korean Traditional House) Village. Continue to Jinan. Vsit the Tapsa Temple at Mt. Maisan. Overnight in Gwangju. 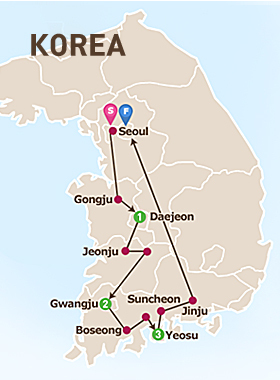 On day four, tour the Green Tea Plantation in Boseong, Naganeupseong Folk Village, Suncheonman Bay Ecological Park, Yongsan Observatory and the Eco-Museum in Suncheon. Stay overnight in Yeosu. On the penultimate day of this tour, take a ferry to Odongdo Island in Yeosu. Next visit Jinju and see the Jinjuseong Fortress. After lunch, head back to Seoul for a final night. Day 1 (Friday) - Arrival at Incheon International Airport. Meet tour guide at hotel. Leave for Gongju the ancient capital of Baekje Kingdom. Experience the tea ceremony with a Buddhist monk at Magoksa Temple, a representative temple surrounded by a mountain and rivers in Chungcheongnam-do Province. Next, visit Tomb of Muryeong King with the wall painting drawn on the number six tomb. Then continue to Gongsanseong Fortress, a mountain castle which was established during the Baekje Period and you can enjoy an archery experience there. Transfer to Daejeon. After dinner, check in hotel and remainder of the day is free at leisure. After breakfast, leave for Jeonju and visit Jeonju Hanok Village which has over 800 traditional Korean houses. After lunch visit Tapsa Temple in Jinan, famous for over 80 stone pagodas built by Lee Gapyong, a retired scholar. Then leave for Gwangju and hotel check in. After breakfast, head to Boseong Green Tea Plantation that is very beautiful, full of green tea fields and cedar trees. You will also have a chance to taste Boseong Green Tea. Next, visit Naganeupseong Folk Village where you can observe the daily dwellings indigenous to the south provincial area. Then explore Suncheonman Bay Ecological Park, thickly covered with reeds taller than a full-grown man, and then stop by Yongsan Observatory to see the bay's beautiful view. After dinner, check in hotel and rest of day is at leisure. After breakfast, take Yeosu Cable Car offering the safe yet thrilling experience with the gondola travelling over the sea. Enjoy the scenery of downtown Yeosu and the archipelago around the old seaport. Next, visit Jinjuseong Fortress which is historically linked to the Japanese invasion in 1592, before returning to Seoul. US$ 1150 per person- based on 2 sharing a room and airport transfers. **N.B. Solo travellers paying single supplement for their tour have inbound airport transfers only. This tour operates with a minimum of 2 persons.